Would you love to visit a grass fed family farm where you can fill up a glass bottle with farm-fresh raw milk from a vending machine explicitly made for this purpose? In the U.K., this is not at all unusual. 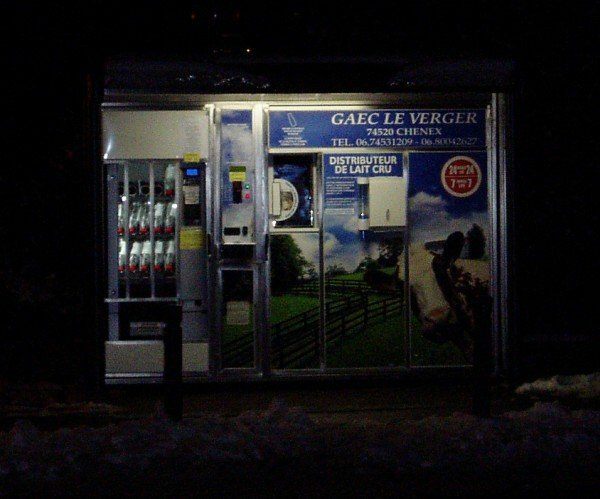 In fact, raw milk vending machines are becoming increasingly popular, including the one recently installed at Home Farm, a dairy farm in Hassop, England. In its first two weeks of operation, the farm owners say the machine has been a huge success and received “incredible” customer feedback. Known as the Simply Milk machine, it’s refilled every morning and provides fresh chilled milk from 7 a.m. to 7 p.m. In stark contrast, while many Europeans are free to enjoy a glass of crisp raw milk anytime they like courtesy of self-serve vending machines, in North America selling raw milk is often forbidden. In Canada, for instance, it’s illegal to sell or give away raw milk, a law that’s enforced in many provinces. Ultimately, the choice of what to eat should belong to the individual consumer, not the state or federal government. If government agencies are allowed to impose their view of "safe food" on consumers, and dictate what’s legal and what’s not, raw milk won't be the only thing lost — one day virtually all food could be pasteurized, irradiated and/or genetically engineered. Unfortunately most of it is not available raw and the list doesn't indicate which brands are and which are not. But some brands are available raw, like Organic Pastures here in California which is available off-the-shelf in many health food stores . In San Diego I know of two health food stores (People's Co-op and Windmill Farms) where I can even buy raw goat's milk! In any event this list is a good place to start, especially for avoiding the 78 brand names that are rated as Poor.